Pascal Vieren Takes the Title! Belgian Pascal Vieren - champion of the Grand Prix at MagicFest Prague. In the end, the huge tournament ended up being only the third largest in Europe so far, but the winner was still one of the most well deserving. Belgian Pascal Vieren dominated the sealed deck portion, and in the draft he only fell to Alexander Rosdahl. In the final he got his rematch and took it in style - deciding the last game with a Kozilek, Butcher of Truth from his sideboard, but not only by attacking with it, with an empty library he ended up using a Shiekmaw to kill his own Eldrazi so he could shuffle his entire graveyard back in. Alexander Rosdahl could only laugh and extend his hand. "I knew that was your route to victory, but I was hoping that you wouldn't see it", was the Swede's response. But Vieren saw it, and became the first champion of a European MagicFest. So we lift our hats and congratulate the MagicFest winner - well done sir! I have done coverage since 2014 and have both played and covered the previous Masters formats. But I can say that Ultimate Masters is without a doubt the most synergistic format I have come across. This weekend I have seen decks make enough Spider tokens with Spider Spawning to run the feature match area out of tokens. I have seen giant Wingsteed Riders with numerous auras and turn four kills via Wild Mongrel, Reckless Wurm and Double Cleave and Reckless Charge. 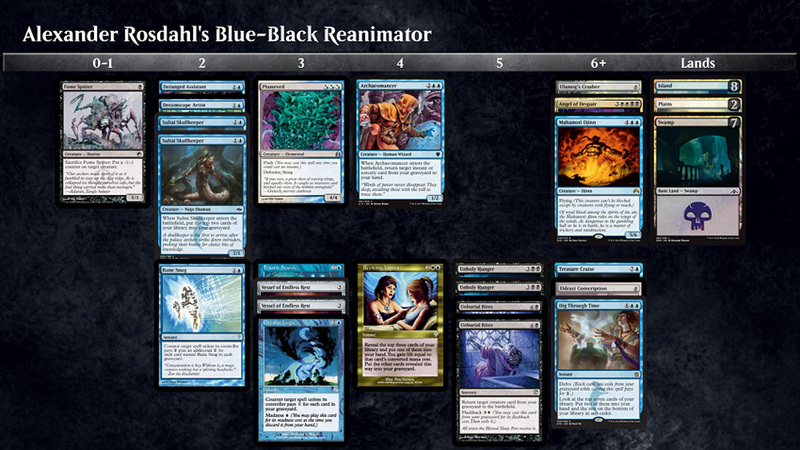 And I've seen reanimation decks putting Reya Dawnbringer in play as early as turn four or five. It does seem like the set makes up for it's name as the ultimate synergistic set. Just look at some of the draft decks from the highest seeded pod in the first draft. All good drafters and all good decks proved that these people really had grasped what the format was all about - it's almost like you're drafting a constructed deck! Or, how about Sebastian Ziller's deck with THREE copies of Sublime Archangel? Someone else who knew what the format was really about was Ondřej Stráský, who drafted this beautiful Blue-Red deck. Don't miss your chance to give Ultimate Masters a final digital farewell when it returns to Magic Online in March! Speaking of synergistic - all weekend long people were sharing stories of crazy thing they either managed to pull off or that their opponents managed to assemble against them. One of the most exciting plays from Day One was Blast of Genius for nine with Artisan of Kozilek, followed with Vengeful Rebirth for another nine. 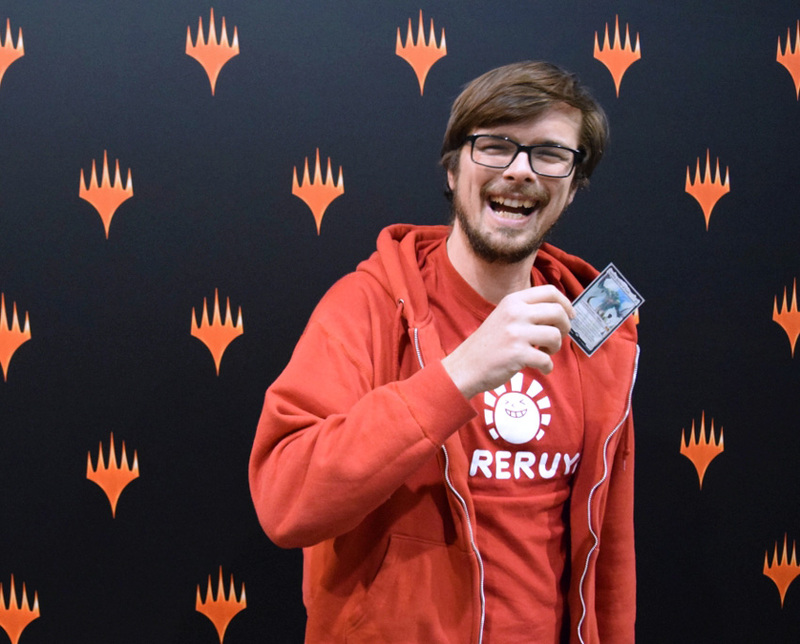 The player that managed it couldn't have a larger smile on his face when he showed his second draft deck containing two copies of Karn, Liberated, along with his two copies of his trusty Vengeful Rebirth. Another player explained how he was on the opposing end of a third turn Woodfall Primus, via turn one Noble Hierarch, turn two Fume Spitter and turn three Pattern of Rebirth on the Fume Spitter, sacrificing it to kill the Hierarch, but searching his library and putting Woodfall Primus into play. Two games in a row seemed to be the flavor of the weekend, as the same opponent did it again in game two. But this turn with turn two Wild Mongrel, turn three Liliana of the Veil, turn four Pattern of Rebirth and activating Liliana on himself to sacrifice the Mongrel and once again search out Woodfall Primus. Sweet combos indeed, and there were plenty of storytellers in the room to share their stories of Ultimate Masters obscenities. (Olle) Remember the guy from yesterday dealing 18 with Blast of Genius at #MTGPRAGUE ? A card that truly spotlights the combo potential of the format is Laboratory Maniac, that Arne Huschenbeth managed to draft a deck around in the second draft of the day. 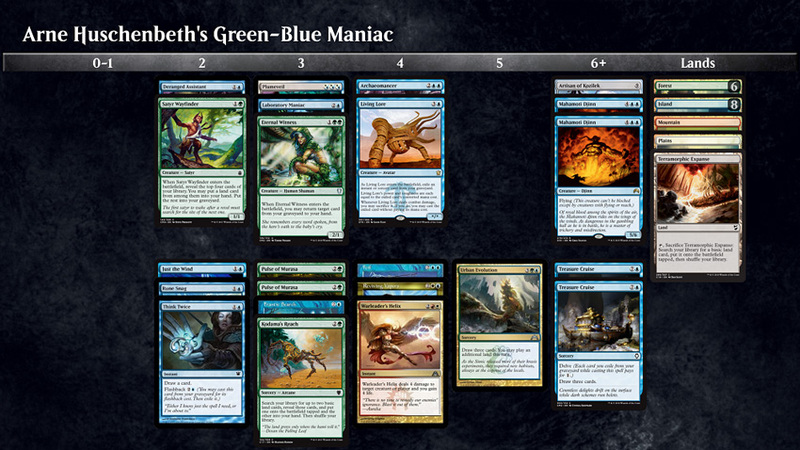 A Green-Blue deck with a ton of ramp spells like Kodama's Reach and card drawing spells like Treasure Cruise and Urban Evolution enabled him to quickly draw through his deck and winning by Laboratory Maniac's ability. He even had multiple copies of Pulse of Murasa to gain life and bring back his Maniac if it would die to opposing removal. 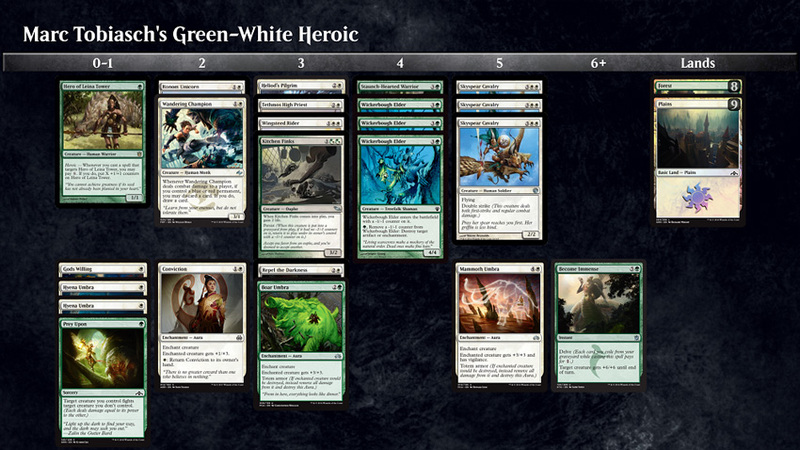 Another deck that clearly caught our eye and lead Arne Huschenbeth all the way to the Top 8. Player Spotlight: Pascal Vieren - Headed for the MPL? While he may not be that well known to the broader audience, someone who has stood out for me the last years is 30-years-old Belgian Pascal Vieren. He put up an impressive 9-0 in sealed this weekend, as well as a few months ago at Grand Prix Warsaw. That time he ended up losing to eventual winner Eduardo Sajgalik in the semi-finals, but this time he took his draft skills all the way to winning the title. I caught up with the player that some regard as the "best player outside of the 32 players in the MPL" after he had just won the first draft at sat at a 12-0 record. I decided to start with a hard question. When was the last time he lost a sealed deck match at a Grand Prix? "Oh, that's a tough one. I'm not even sure. I know I lost a match or two in team sealed last year. But an individual Grand Prix? Sometime in 2016 probably. I haven't played that many lately and was lucky enough to 9-0 in Warsaw as well", he answered. His accomplishments lately doesn't stop there though. 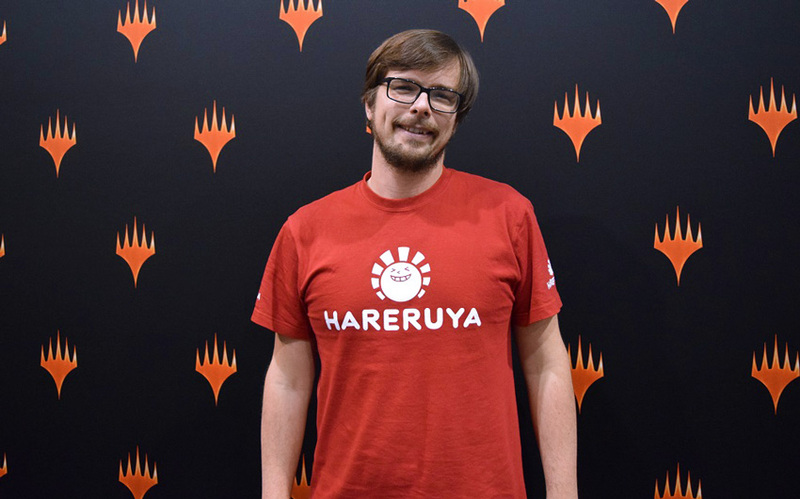 He made his first ever Pro Tour Top 8 at Pro Tour Rivals of Ixalan in early 2018 and put up an impressive 10-0 record in standard at Pro Tour Guilds of Ravnica a few months ago. For someone who seems to know his way around both limited as well as Modern and Standard, the Belgian didn't have to think long when asked what format he prefers the most. "Definitely limited. I really like that it's not as repetitive, and I like to put in a lot of time to study the format. Both reading about it and playing with the cards. I actually prepare a lot even for sealed deck. People might think that there is a lot more luck to it because it depends on what you open, but I disagree and think that there is very much skill in deck building in sealed deck as well." 2018 as a whole, was a pretty good year for Pascal Vieren. And he seemed to be on fire this weekend as well. 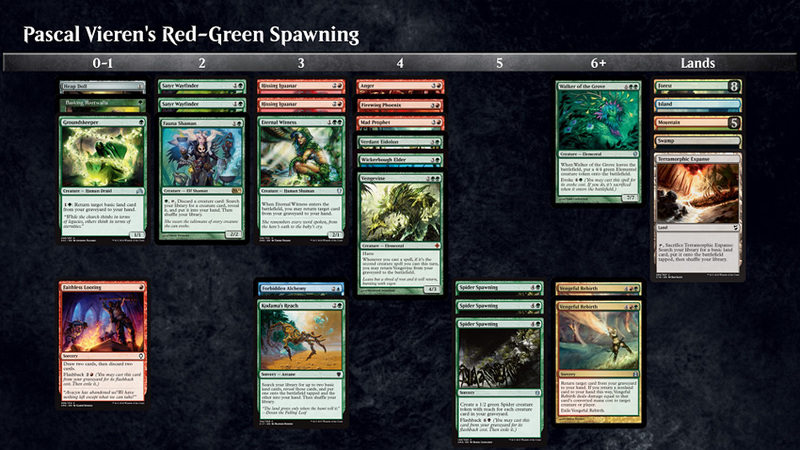 After 9-0 in sealed deck he won the first draft with a Red-Green deck featuring three copies of Spider Spawning. In one match he even created so many spiders that the feature match area ran out of spider tokens. Vieren said he favored green and red in the format, and proved that it worked in the first draft of Day Two. "The three Spider Spawning made the deck invincible in the late game, but the Satyr Wayfinders is what really put the deck together. I also liked the ability to win with direct damage from Hissing Iguanar or Vengeful Rebirth", he explained. 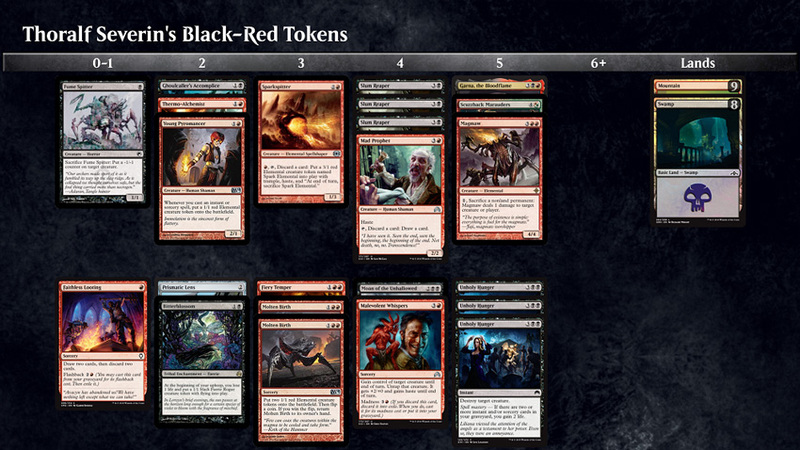 Neil Rigby almost ran out of tokens when Pascal Vieren's spiders started spawning. When asked about his goals for the future, Pascal Vieren had to think for a while. Last year he was determined to prove himself good enough to hit Platinum Pro status. And where the recent changes to the Pro Players Club and the inauguration of the Magic Pro League may have stirred confusion among some pros, for Pascal Vieren it lit a fire to prove himself even more on the Pro scene. "I am the father of three and don't have as much time to play Magic as I used to when I was young. But I don't really do much else than work, take care of my family and play Magic, so my new goal is to become one of the top 32 players and make it into the MPL eventually. I even decided to work a bit less to have time to play more and try to reach my goal", he said. And after this weekend, he might have a foot in already. While the main event this weekend was the 2,500 player Grand Prix there were nearly as many people playing in one of the numerous side events. According to organizers Channelfireball over 1,000 people chose to sign up for one of their "fanatics" packages, granting entry to six side events in either limited of constructed over the weekend. You do the math - that comes to almost 4,000 players in the halls of PVA Expo Praha with a single game on their minds - Magic the Gathering. Not to mention the ten or so vendors selling singles ranging all the way back to Alpha from 1993 to fresh from the factory Guilds of Ravnica. A lot of buzz also surrounded the prizes at side events, since the winners had a chance to try their luck with Ultimate Masters Box Toppers rather than just boosters. And both seasoned pros and local casual players seemed to be enjoying themselves at the side events. Italian Andrea Mengucci seems to be playing almost as many side events as Grand Prix Day Two's, and Prague was no exception. As was Dane Thomas Enevoldsen, famous for his love of both eternal formats and mono-white control decks in Legacy. He wasn't just fooling around though, as he right after the Grand Prix had finished managed to 4-0 a Legacy event and suddenly found himself with quite the bounty. His prize? Two Ultimate Masters box toppers of course. The perfect chance to share the excitement with both his followers and coverage reporters. And those are only a sample of all the excitement at the venue this weekend. Artists were here as always, and the hall could hardly fit more than a few cosplayers.Needless to say a whole lot of people had a whole lot of fun playing the game we've all learned to love. Whether it is in the form of 15 rounds of swiss and a top 8 draft or trying to hit that Mythic level in best out of one on MTG Arena. With that - we thank you for tuning in to the stream this weekend, and who knows, maybe you've even enjoyed our written coverage or the tweets I've tried to keep you updated with glimpses of the massive tournament. My next European event is the Mythic Championship in London in April, and I hope to see some of you there - whether I will be involved in coverage or competing as a player in either the Mythic Championship or the MagicFest that takes place at the same time. Thanks for now, and until next time!